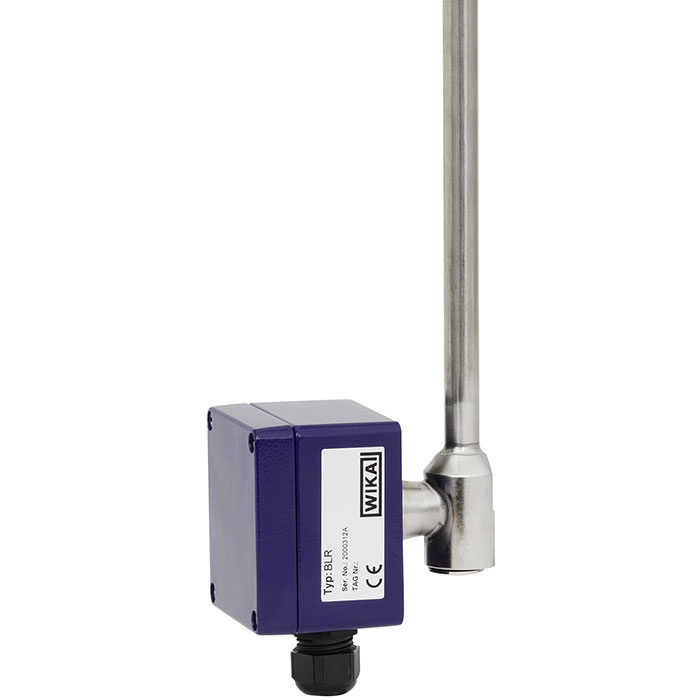 The model BLR reed sensors are used for continuous monitoring and recording of the liquid level in connection with transmitters. They work on the float principle with magnetic transmission (permanent magnet, reed switch and resistance measuring chain) in a 3-wire potentiometer circuit. A magnetic system built into the float actuates reed contacts, through the walls of the bypass chamber and of the sensor tube, in a resistance measuring chain (potentiometer). The measurement voltage generated by this is proportional to the fill level. The resistance measuring chain is made up from reed contacts and resistors soldered onto a PCB. Depending on requirements and design several different contact separations from 5 to 18 mm are available. For selecting the optimum sensor (sensor model, connection housing, electrical connection, sensor tube (material and total length), contact separation, head-mounted transmitter, measuring range, approval) we offer application-related technical advice.